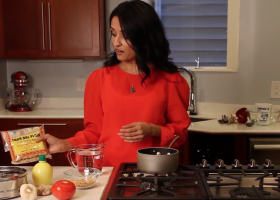 I’ve been in the kitchen with my grandma, and parents since I was two feet tall so don’t find the idea of making Indian food daunting, but we all know that it is time-consuming. Plus, it requires a lot of ingredients that many of us don’t have in our kitchens. 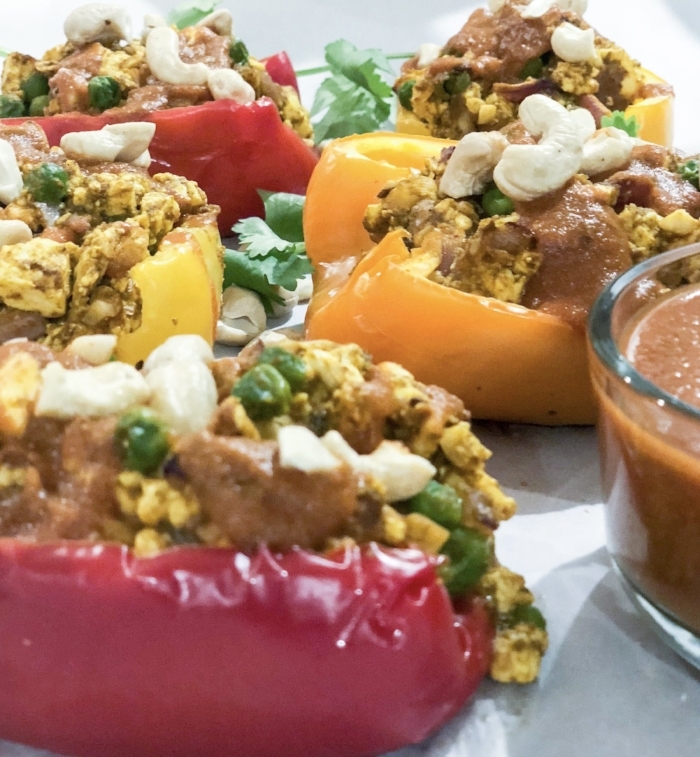 These paneer stuffed peppers turned out great, are a healthier option over eating paneer with rice or naan, and you can prep ahead of time to make life easy. If you don’t have all of these spices you can substitute turmeric, coriander, garam masala and cumin with 1 tablespoon of curry powder. 1 tsp coriander powder or sub 1/2 tablespoon of curry powder for spices. I do recommend keeping the fennel seeds in this recipe if possible. 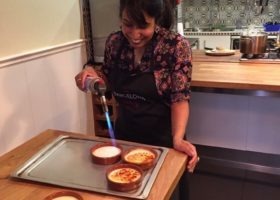 They give a unique taste to the gravy which will blow your mind! Paneer is available at Costco! Use half of the block from Costco for this recipe. 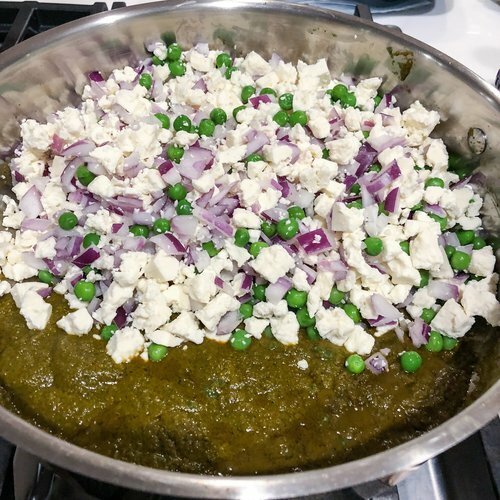 Crumble paneer, chop onion, and thaw peas a day ahead. 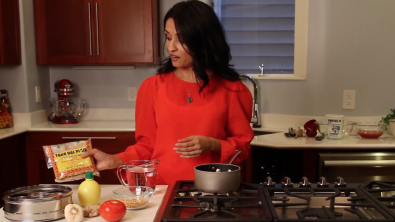 Garam masala is available at most grocery stores! I’ve seen it at my local Target. Allergic to nuts? Substitute cashews with seeds i.e. sunflower or pumpkin, or omit. I did not have cumin powder so I toasted my cumin seeds in oil before adding the cilantro chutney. You can also grind them directly with the other ingredients. Personal preference!
) Preheat oven to 400 degrees. Cut bell peppers in half lengthwise, and remove seeds and membranes. Lightly salt and set aside in a large baking dish/tray. 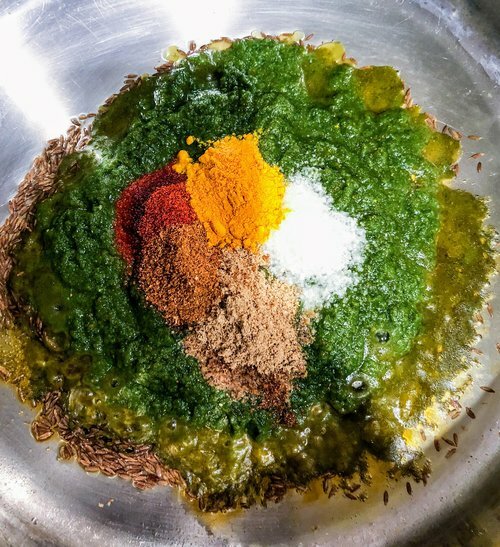 Blend ingredients for cilantro chutney, and set aside. In a large pan, heat 1 tablespoon of oil then add most of the cilantro chutney (approx 1 cup), and saute for 1 to 2 minutes until fragrant. 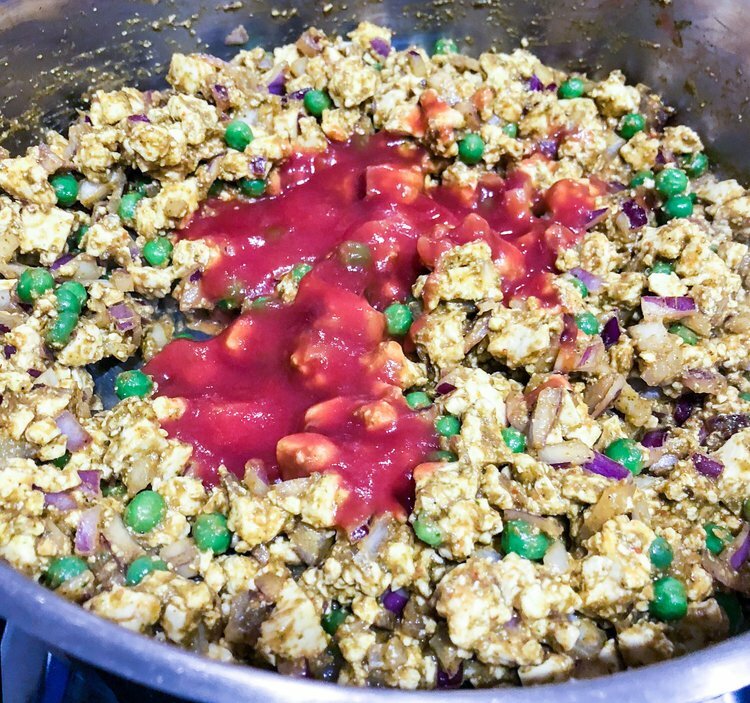 Add 1 cup of tomato puree or sauce to chutney, heat through, and then add crumbled paneer, onion, and peas. Mix well. Remove from heat and add chopped cashews. 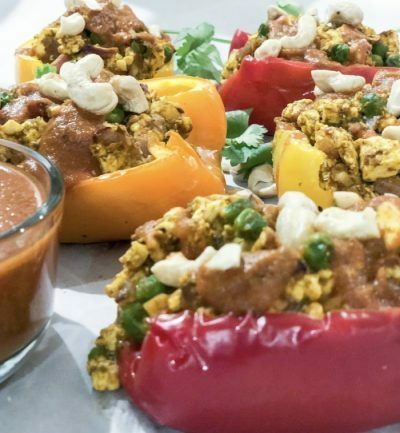 Fill bell pepper halves with paneer filling. Bake covered with foil for 15-20 minutes. Cook times may vary per oven, and depends on as how done you want your peppers. If you prefer a softer pepper bake for an extra 5 minutes. While peppers are in the oven make the spicy tomato gravy (tikka masala). Heat 1/2 tablespoon of oil to pan, then add fennel seeds. Toast until fragrant then add reserved cilantro chutney. Cook for 1-2 minutes then add 3 cups of tomato sauce. Season with 1/2 teaspoon more of salt, turmeric, and red chili powder if desired. Bring to simmer, then add half and half or cream. Remove from heat. Depending on your batch of tomato sauce you may need to add 1-2 teaspoons of sugar to balance out the acid and this will round out the spices as well. How did it turn out? Let us know in the comments section! 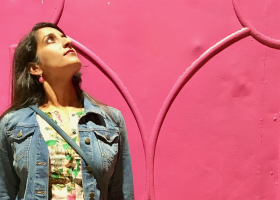 About Michele: Michele Narsinghani is a Chicago resident, clinical pharmacist, and mother to a hyperactive two-year-old with a passion for cooking that goes back decades. Between professional, parental, and social activities there aren’t many hours left in the day to cook for her family. 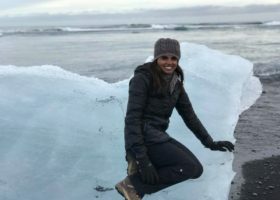 After having her son, Shayaan, and going back to work full-time, she managed to get pretty crafty with her family’s meals. They had to be easy, healthy–since hitting the gym also became less frequent–and most of all, tasty. You can follow Michele on Instagram, Facebook or on her website, Mom Under Pressure.